Some love their cars, some their motorbikes, but it is hard to find a love as special as the one people have for their horses. In the Chinese zodiac, if you are born in the Year of the Horse you are likely to be intelligent, independent and have a free spirit. If horses have these qualities, no wonder people love them so much! In horse riding, the relationship between the horse and the rider is the most important factor in creating an enjoyable experience for both. Whether you are considering riding regularly and even buying a horse, or just going on a one-day trail ride, getting to know your horse may be the most interesting and rewarding part of your journey. As a fitness pursuit, horse riding takes two forms  trail riding and equestrian. Trail riding is the most suitable for beginners and involves riding  usually with a group  along a trail, and is supervised by a guide. Trail rides can range from a two-hour ride for relaxation, to an adventure pursuit, such as a week-long camping and exploring trip in the mountains. As well as developing back and abdominal muscle tone and balance, and co-ordination skills, trail riding provides the opportunity to be with the horse in a natural, and often beautiful, environment. Youll probably be pointed towards a friendly old horse for your first ride. Dont worry; most schools have a frisky steed in the back paddock for when you are ready to gallop. Equestrian riding takes place in a fenced space, such as a paddock or field. 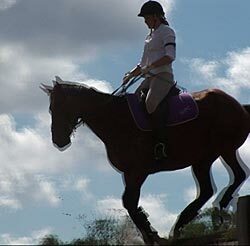 Beginners learn to ride and care for their horse, and then the skills for particular events, such as dressage and show jumping. Dressage involves training the horse to perform natural movements, such as walking and cantering, upon request from the rider. While training and performing on a Lipizzaner stallion may be a little beyond your ambitions, horse and pony clubs are a great way for you to learn more about your horse and broaden your riding skills. All club members are allocated to one of three groups  beginners, intermediate and advanced. All levels of experience are catered for. Instructors take riders through many different activities, including care and maintenance of your mount, jumping, and cross-country riding. As well as being a learning experience, its a great social event for you and your horse. Equestrian events are performance sports, and marks are not only awarded for technical competence but also for grooming and posture  and not just for the rider. Owners, riders and stable hands are all experienced in spending many hours preparing their horses to look elegant and well groomed for the event. Equestrian riding is an elite event, with both Olympic and World Championship status. But it is increasingly becoming a sport for everyone and is particularly enjoyed by those with disabilities or learning difficulties. Horse riding gives people with disabilities the opportunity to develop social skills as well as gain therapeutic benefit from the physical and mental activities involved. Riding has been shown to be beneficial for a range of people with disabilities, including those with cerebral palsy, spina bifida, Down syndrome, intellectual or learning disabilities, and people who are recovering from injuries after accidents. To even get up on a horse can be a joyous event for someone who may be excluded from other sporting activities because of physical limitations. For many, it is a dream come true. 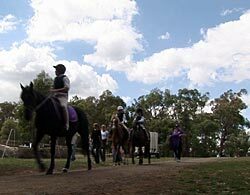 Our thanks to the Nunawading and District Horse and Pony Club for their participation in this story.